EBook on its own USB flash drive. The Mayans believed the World rested on the back of a turtle. 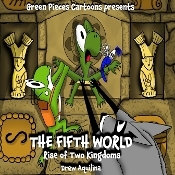 In conjunction with that philosophy and the Mayan doomsday prophecy foreseeing the end of the Fourth World on December 21, 2012, Green Pieces Cartoons welcomes you to an adventurous, comical story involving one small, naive, claustrophobic turtle and his friends. The ‘Mayan Rescue Team’ travels 4,000 miles from the backwoods of Connecticut to the jungles of Mexico in the name of saving the World. The friends remain just one step ahead of government agencies out to stop them, battling unpredictable weather and human elements to reach the Mayan Temple of Turtles in time to prevent the cataclysmic beginning of the Fifth World. Read on and learn if and how Iggy can save the planet.